DBA Dojo | A place on the way of the DBA "Tao DBA" Oracle, MySQL databases and more on EC2. I have watched the progress of PostgreSQL for a while now and read the recent updates for the 9.5 release. I was impressed at the amount and depth of features that are in PostgreSQL. Coming originally from an Oracle DBA background I tend to appreciate what features are missing in MySQL. MySQL in some respects benefited from a network effect from being the M part in the LAMP stack. But that is pretty much history now. So how much difference is there between MySQL and PostgreSQL? Many of the search results whilst good on pagerank are dated and old. 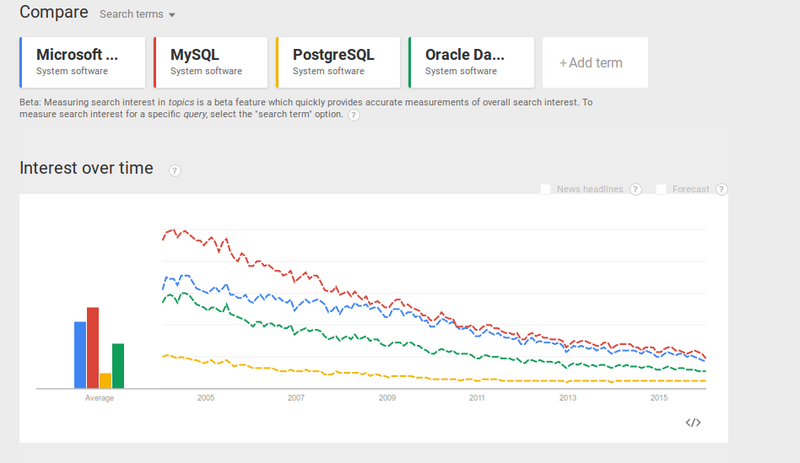 Turns out MySQL still is the fairest, but all the main relational/SQL databases have trended down over time. I came to the conclusion that back in ’em olden days of the web, back in ’04, the searches were far more technical. By 2015 those type of searches have been overwhelmed by searches such as fb and facebook. So my question remains partially un-answered. Yes MySQL is still clearly the most searched for term in relation to SQL databases, JSON related stuff is trending up. But in terms of overall search traffic all database related searches are going down. In the end I came to the conclusion that I need to spend more time with PostgreSQL specifically its biggest feature gap it had with MySQL until recently i.e. replication.